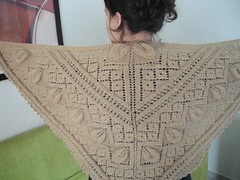 This shawl was created by Beatriz Medina for the second KAL project organized by us. >> Misterious Project II, by Beatriz Medina. >> See more finished projects inÂ our gallery. JÃ¡ salvei pra quem sabe, um dia, eu faÃ§a um pra mim. Precisa de coragem, nunca fiz nada parecido.